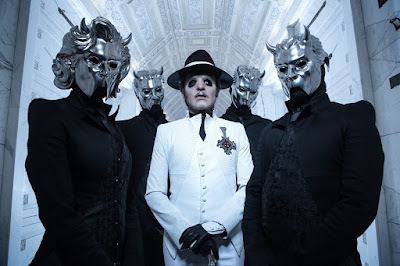 Ghost ended a May 31 show at The Riverside Theater in Milwaukee, WI early after a fan collapsed at intermission and later died at hospital, according to a report by the Milwaukee Journal Sentinel. The Swedish band had just announced an intermission around 9:15 p.m. when a man in the pit fell to the ground, according to a fellow concertgoer; fans flagged security for help, CPR was issued, and people were cleared out of the venue around 9:45 p.m. when security advised fans that the remainder of the show was canceled. The Milwaukee Medical Examiner said the man was transported to Columbia St. Mary's hospital, where he died late Thursday evening of natural causes. No autopsy was planned; his name and other details were not released. "We are saddened by the tragedy that happened at the Riverside Theater last night,” said The Pabst Theater in a released statement, according to CBS 58 Milwaukee. “Our deepest sympathy and condolences go out to the family and we ask the public to respect their privacy. We appreciate the efforts of the Milwaukee Police Department, Milwaukee Fire Department and Per Mar Security in quickly responding and assisting during this difficult time." The set marks the group’s first record with new singer Cardinal Copia, who officially replaced outgoing singer Papa Emeritus III in the lineup following his work on the band’s third album, 2015's "Meliora", and 2016’s "Popestar" EP.